On 21 March 1898, Louisa M. Daniel sold Julius F. Freeman a 125-acre tract called the Arky Gardner land in Gardners township. Freeman paid her $500. Freeman married Eliza Daniel (or Daniels), daughter of Amos and Olive Daniel, in 1873. Was Louisa her kin? Deed book 46, pages 421-422, Register of Deeds Office, Wilson County Courthouse. Jacob and Sarah Barnes Daniel house. In the 1850 slave schedule of the North Side of the Neuse, Wayne County, Jacob Daniel is reported with eight slaves, four girls and women aged 4 to 35, and four boys and men, aged 1 to 50. In the 1860 census of Black Creek township, Wilson County: farmer Jacob Daniel, 55; wife Sallie, 60; Willie Batts, 20; Teresa Batts, 21; and James Flora, 16. reported $6000 in real estate and $600 in personal property, including enslaved people. In the 1860 slave schedule of Black Creek township, Wilson County, Jacob Daniel is reported with four enslaved men and boys, aged 9 to 60. The 1870 census of Wilson County lists many dozens of African-Americans with the surname Daniel living throughout the eastern half of Wilson County. James and Zilpha Newsome Daniel house. In the 1850 census of the North Side of the Neuse River, Wayne County: farmer James Daniel, 48; wife Zilpah, 47; and her children Elizabeth, 23, Eliza, 21, Lawrence, 19, Joseph, 15, James, 17, Sarah, 12, Mary, 8, and Martha, 8. In the 1850 slave schedule of the North Side of the Neuse, Wayne County, James Daniel is reported with eight slaves, five girls and women aged 3 to 26, and three boys and men, aged 1 to 35. In the 1860 census of Black Creek township, Wilson County: farmer Zilpha Daniel, 53, and her children Elizabeth, 33, Eliza, 29, Larry, 28, Sallie, 19, Mary, 18, and Martha, 18. Farm laborer Smithy Artis, 38, a free woman of color, and her son George, 21, described as “idiotic,” also lived in the household. [The term was often applied to deaf people.] Daniel reported $8000 in real estate and $12,000 in personal property, including enslaved people. In the 1860 slave schedule of Black Creek township, Wilson County, Zilpha Daniel is reported with 14 slaves, eight girls and women aged 1 to 39, and six men and boys, aged 2 to 39. Cemeteries, no. 12: the Becky Pate cemetery. Just beyond the northeast edge of Lucama, down a sandy road closely bordered in mid-summer by four-foot tobacco plants bristling with green-gold leaves, is the Becky Pate cemetery. 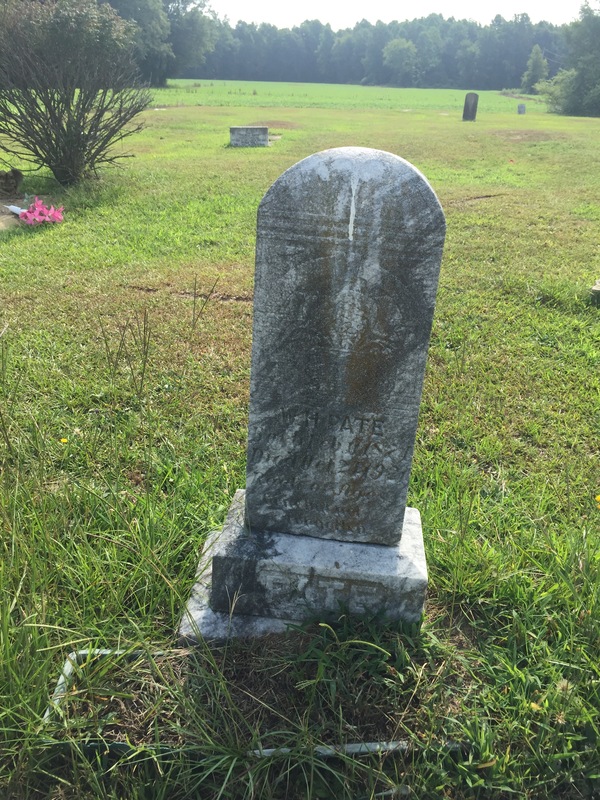 I did not see Rebecca Daniels Pate’s grave, but her Wilson County death certificate notes that she was born in 1827 in Wayne County to Arch and Leah Daniel; that she was the widow of Richard Pate; and that she died 31 March 1935 in Cross Roads township, Wilson County. [Census records indicate that she was more likely born about 1845.] Richard Pate died in Cross Roads township on 21 February 1935. 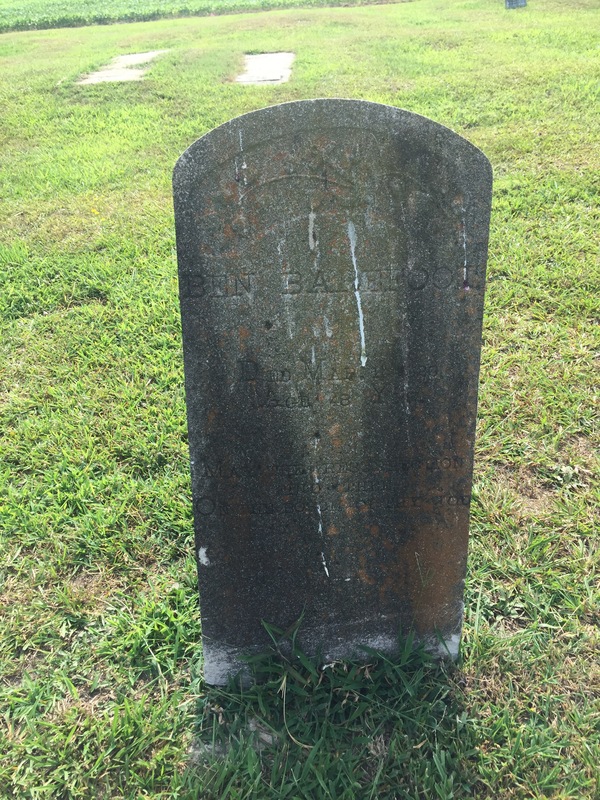 His death certificate shows that he was born in about 1835 to unknown parents; was married; was a farmer; and was buried in Pate Daniel Grave Yard. It is probable that this is the same burial ground as Becky Pate cemetery and that the cemetery is located on land that once belonged to Arch Daniel. In the 1880 census of Cross Roads township, Wilson County: Leah Daniel, 69, and grandson Wm. Henry Pate, 7. In the 1900 census of Cross Roads township, Wilson County: farmer William H. Pate, 26; wife Rachael, 24; brother Jesse, 10; sister-in-law Nellie Peacock, 11. In the 1910 census of Cross Roads township, Wilson County: farmer William H. Pate, 36; wife Fichrel, 34; and brother Jesse, 20. William Henry Pate registered for the World War I draft on 12 September 1918 in Wilson County. Per his registration card, he lived at Route 3, Lucama; was born 11 February 1874; engaged in farming; and was married to Firchel Pate. In the 1920 census of Cross Roads township, Wilson County: farmer William H. Pate, 46, and wife Firchel, 44. William Henry Pate died 24 October 1921 in Cross Roads township, Wilson County. Per his death certificate, he was born 1873 in Wayne County to Alford Pate and Pollie Ann Daniel and was a farmer. Mittie D. Dew was a granddaughter of Arch and Lear Daniel. Her murder is detailed here. Polly Ann Artis Daniel was married to Isaac Daniel, grandson of Arch and Leah Daniel. (Polly is listed as Isaac’s first wife on his death certificate. And Rebecca Pate is listed as his mother.) Polly Ann died in 1908. In the 1880 census of Wilson township, Wilson County: farmer Mike Barefoot, 36; wife Caroline, 26; and children Olive, 12, Willie, 10, Rena, 8, Benjamin, 6, Ida, 4, Warren, 2, and Julia, 1. In the 1900 census of Wilson township, Wilson County: Caroline Barefoot, 50, and children Ben, 21, Jula, 19, and Willie, 29. In the 1910 census of Cross Roads township, Wilson County: on Railroad Street, Benjamin Barefoot, 28, brickyard laborer, and his companion William Williams, 35, also a brickyard laborer. Ben Barefoot registered for the World War I draft in Wilson County on 12 September 1918. Per his registration card, he was born 15 January 1881; resided at Route 1, Lucama; worked for Sparse Renfrow; and his nearest relative was Wiley Barefoot. In the 1910 census of Cross Roads township, Wilson County: farm laborer Willis Adams, 65, and wife Jane, 65, plus Ed Manuel, 25, farm laborer. Ed Manuel registered for the World War I draft in Wilson County. Per his registration card, he resided in Lucama, Wilson County; was born 17 September 1879; worked as a farmer for E.B. Capps; and his nearest relative was Pinkney Williams, Florence, South Carolina. In the 1920 census of Cross Roads township, Wilson County: Ed Manuel, 30, farmer. In the 1930 census of Cross Roads township, Wilson County: Edd Manuel, 49, farmer. In the 1940 census of Cross Roads township, Wilson County: Edd Manuel, 61, farmhand. 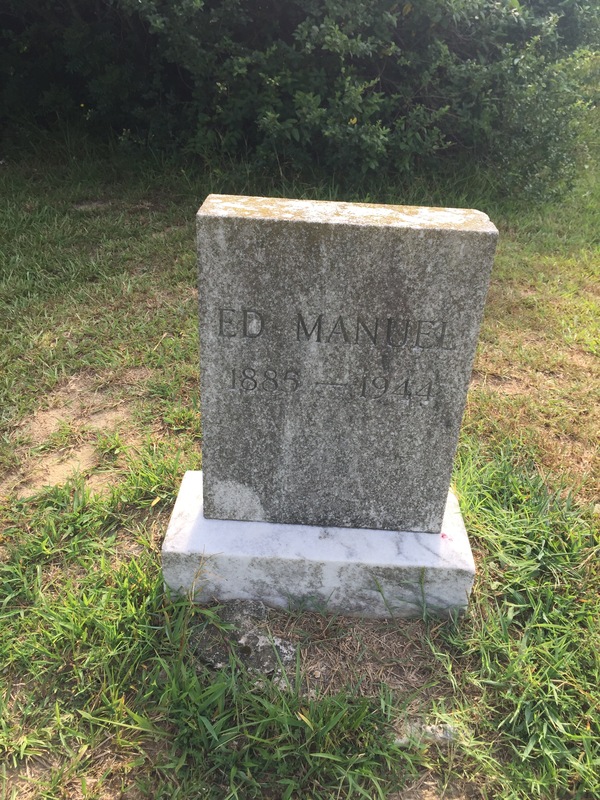 Ed Manuel died 19 September 1944 in Fayetteville, Cross Creek township, Cumberland County, North Carolina. 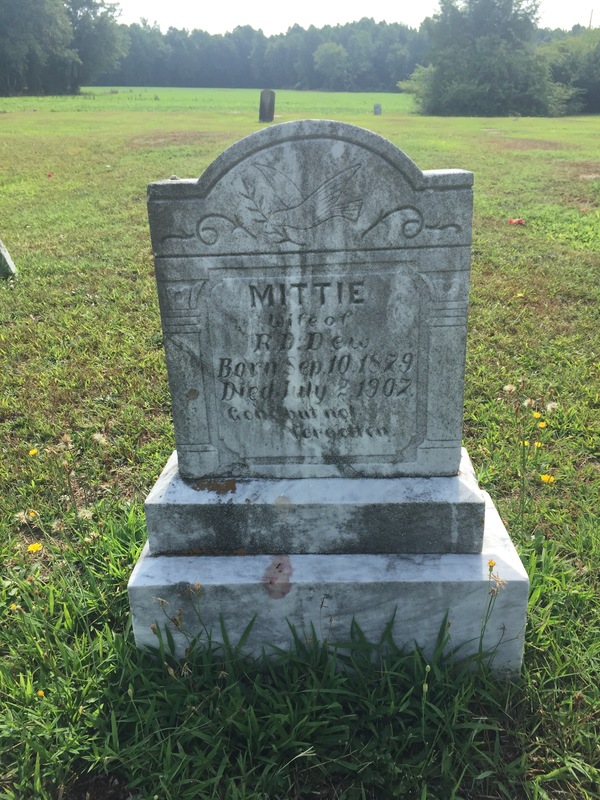 Per his death certificate, he was single; born in South Carolina about 1885; worked as a farmer; and was buried in Beckie Pate cemetery, Wilson County. Informant was Hubert Knight, Route 2, Wilson. Dew triangle ends in murder. News & Observer (Raleigh), 4 July 1907. A few days later, the Clinton Caucasian reported different details. Clinton Caucasian, 11 July 1907. News & Observer (Raleigh) 12 October 1907. Somewhat surprisingly, five years later, Dew received a conditional pardon at the recommendation of the trial judge and jury. Greensboro Daily News, 16 November 1912. In the 1880 census of Cross Roads township, Wilson County: farmer Louisa Dew, 35, and children Isaac, 20, Nellie, 17, Mourning, 10, Grant, 9, Raiford, 7, Mary Ann, 6, and Amos, 2. In the 1900 census of Cross Roads township, Wilson County: farm laborer Roford Dew, 25; wife Mittie, 20; and children Lee M., 3, and Murray, 5 months. Two households away: widow Louisa Dew, 65; daughter Mary, 27, and son Amos, 20; Roselle Deans, 75; and widowed sister Ellen Emerson, 60. In the 1910 census of Halifax township, Halifax County: at State Farm #1, Raiford Dew, 38, prisoner. On 23 August 1914, Raiford Dew, 44, of Cross Roads township, son of Amos and Louisa Dew, married Maybel Dawson, 18, of Cross Roads township, daughter of Perry and Sarah Dawson. Witnesses were Grant Dew, W.H. Mickerson and Vanderbilt Dawson. In the 1930 census of Black Creek township, Wilson County: farmer Raiford Dew, 57; wife Mary Belle, 34; and children Clarence, 15, Lema, 13, and Joseph, 11; sister-in-law Dazzell Dawson, 17, and her daughter Sarah, 4; and brother-in-law Willie Dawson, 19. Raford Dew died 28 December 1933 in Black Creek township, Wilson County. Per his death certificate, he was 62 years old; married to May Belle Dew; was a farmer; and was the son of Amos and Louisa Dew. Photograph of headstone courtesy of Findagrave.com. Studio shots, no. 10: Benjamin A. Harris Sr.
As noted here, Benjamin Amos Harris was one of a small group of kinsmen, including Julius and Oliver Freeman, who traveled nearly 700 miles from Wilson to Alabama to attend Tuskegee Institute. He was awarded a certificate in May 1917, returned home, and established a bricklaying business that his sons carried on after his untimely death. On 25 January 1894, Edwin Harris, 21, married Bettie Daniel, 21, at the residence of Amos Daniel in Wilson County. In the 1900 census of Fremont township, Wayne County: day laborer Ed Harriss, 27, wife Bettie, 24, and children Benjamin A., 5, Roday [Rhoda], 4, and John H., 6 months. In the 1910 census of Nahunta township, Wayne County: farmer Ed Harriss, 37, wife Bettie, 34, and children Benjamin, 15, Rhoda, 14, Johney, 10, Nanny, 9, Nicey and Vicey, 7, Edgar, 4, and Oscar and Roscar, 1. Ed Harris died in Nahunta township, Wayne County, on 25 February 1918, perhaps while his oldest son Ben was away at war. Per his death certificate, he was born in Wayne County in 1872 to Sylvester Harris and Rhoda Daniel and worked as a farmer. He was buried at “A.D. Scott’s place.” Son John Harris was informant. Bettie Harris died eleven months later. Per her death certificate, filed in Wayne County, she was born 29 September 1875 in Wilson County to John Daniels and Millie Daniel. She too was buried at A.D. Scott’s place; son Ben A. Harris was informant. On 14 March 1922, Benj. A. Harris, 25, married Pauline Artis, 20, in Nahunta township, Wayne County. She was the daughter of Noah and Patience Mozingo Artis. The Harrises moved ten miles into Wilson shortly after their marriage. In the 1925 Wilson city directory: Harris Benj bricklyr h 407 Viola. The National Register Historic Places registration form for East Wilson Historic District describes Ben Harris’ house at 312 Finch Street this way: “1941. 1 1/2 stories. Benjamin Harris house; brick veneered Tudor Revival dwelling built by Harris for his home; Harris was a brickmason; fine example of this style in district.” His descendants have lived in the house for more than 75 years. Benjamin A. Harris died 15 May 1955. 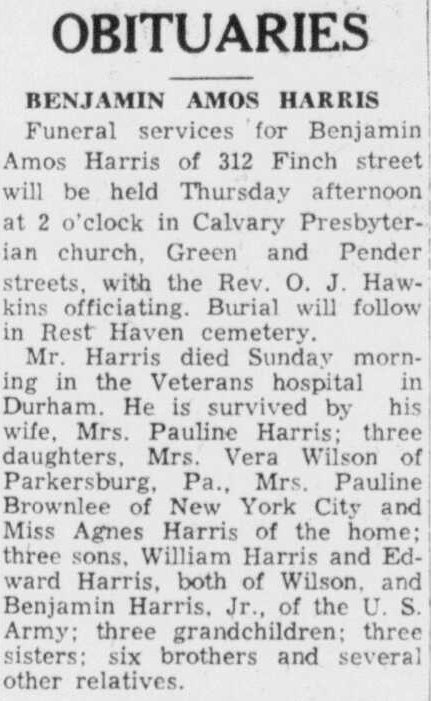 Wilson Daily Times, 18 May 1955. Benjamin A. Harris’ grave at Rest Haven cemetery, Wilson. Photograph of Harris courtesy of Ancestry.com user ladyjmcnow. 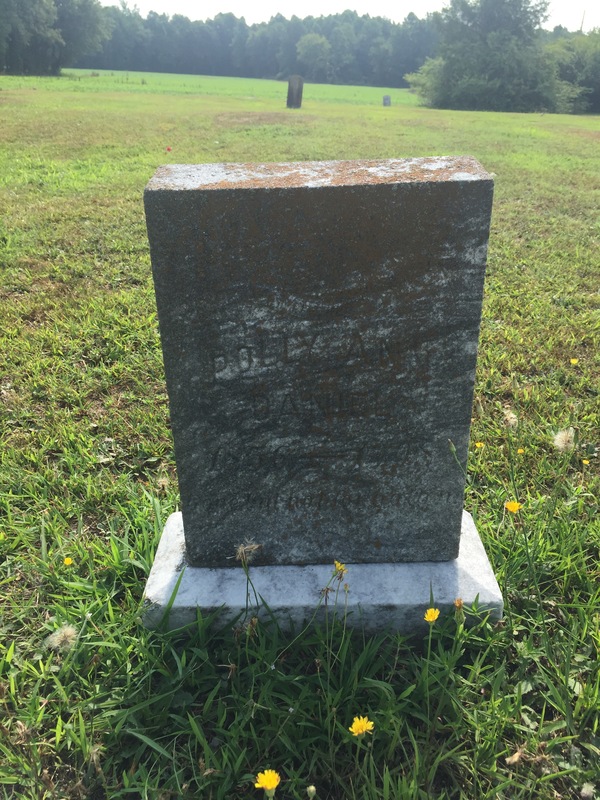 Photo of grave by Lisa Y. Henderson. His wife raised him almost like a white child. Moses Daniel (Freedman) reported to the Superintendent of Freedmen at Goldsboro that his former master Jacob Daniel a highly respectable citizen of this County refused to give to him his child Bob – whereupon the Superintendent Geo. O. Glavis ordered Mr. Daniel to give the child up and Mr. Daniel to obey the order & prevent any disturbance gave the boy up. He now appeals to you to have the boy restored to him. He is willing to have the boy bound to him and will do all in that regard that may be required. The following circumstances are the bases on which he makes his appeal. The mother of this boy Bob never had any husband and died when the boy was not over six months old. The Man Moses was the slave of Mr. Daniel and had a wife by whom had children at a neighbors (Mr. Farmers.) It may be that Moses is the father of the child but if so it is an illegitimate one. The Boy Bob has been raised by Mr. Daniels wife almost like a white child – and was esteemed highly and has never evinced any desire to leave his home. He is now about 15 years of age. The Reputed father by reason of the order aforesaid has taken the boy and hired him as common laborer to a Mr Barefoot in this County, as Mr. Daniel has been informed. Common justice it is thought would restore the boy until he is twenty one to the one who has been at all the trouble and expense of raising him. Your Kind offices are respectfully prayed for in behalf of Mr. Daniel. Farmer Jacob Daniels, 64, appears in the 1870 census of Black Creek township, Wilson County. There is no Bob or Moses Daniel in Wilson County, but in adjoining Nahunta township, Wayne County: Moses Daniel, 27, wife Clarkey, 40, plus Smith, 18, Harry, 21, and Jane Daniel, 10. Records of Assistant Commissioner of the State of North Carolina; Bureau of Refugees, Freedmen and Abandoned Lands; Record Group 105, National Archives; Freedmen Bureau Records of Field Offices, 1863-1878 [database on-line], Ancestry.com. Death of a worthy colored woman. Wilson Daily Times, 7 October 1913. James Daniel, 20, son of Stephen and Debby Daniel, married Louisa Davis, daughter of Rosetta Davis, 19, in Greene County on 16 September 1877. In the 1900 census of Wilson, Wilson County: day laborer James Daniel, 40; wife Louisa, 42; and children Debby Ann, 20, Ella, 17, Jesse, 14, Joseph T., 13, Minnie, 11, Louisa, 8, and Lily Clem, 3. In the 1910 census of Town of Wilson, Wilson County: laborer James Daniel, 50; wife Louise, 53, laundress; daughters Minnie, 21, Louise, 19, and Lillie C., 17, all cooks; daughter Debie Black, 30, and her children Jessie, 9, Moses, 6, Minnie, 2, and Gertie Black, 1 month; and Ellen, 50, and Allen Armstrong, 18. To give my heirs that has not been heard from since the Surrender time to come in. Arch Daniel and Leah Daniel had been married 35 years when they registered their cohabitation in Wilson County on 27 August 1866. In the 1870 census of Crossroads township, Wilson County, 65 year-old farm laborer Arch Daniel and 54 year-old wife Leah shared their home with Isaac, 12, and Margrett Daniel, 8. The children were likely their grandchildren. Isaac Daniel, 21, married Zillah Odum, 21, on 14 March 1875 at Black Creek. Fifteen days later, ten years after Emancipation, Arch Daniel made out his will. Margaret Daniel, 16, married Lenard Barnes, 23, on 3 May 1877 at Arch Daniel’s home. Arch died not long after, and his will was proven in court on 18 July 1877. Apparently, none of his lost children returned, and Leah Daniel and Rebecca Pate were declared his sole heirs. Leah remained on the land and is listed in the 1880 census of Crossroads township with grandson Wm. Henry Pate, 7. Rebecca Pate, widow of Richard Pate and daughter of Arch and Lear Daniel, died in 1935 in Crossroads at the reputed (and exaggerated) age of 108. North Carolina, Wills and Probate Records, 1665-1998 [database on-line], Ancestry.com. I want to come back right away. 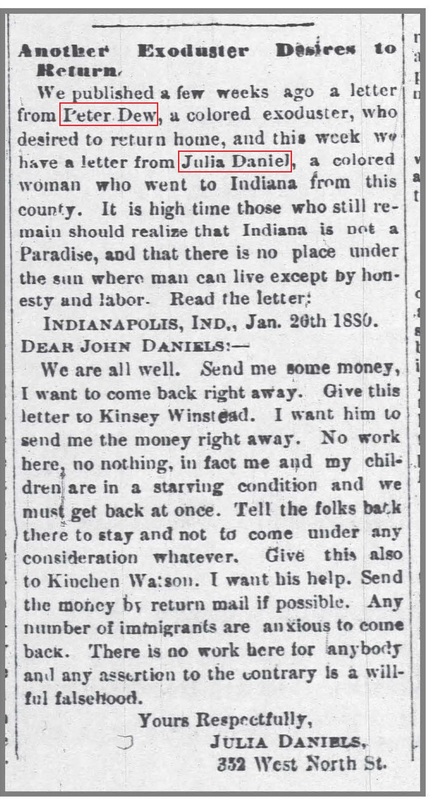 Wilson Advance, 6 February 1880. Forty-seven year-old white farmer Kinsey Hyman “K.H.” Winstead headed a household in the 1880 census of Wilson township, Wilson County. Farmer Kinchen H. Watson, 29, is listed in his mother’s household in Wilson township, south of the Plank Road. I have not found Julia Daniels. However, in the 1880 census of Indianapolis, Marion County, Indiana, 32 year-old Peter Dew, his wife Ellen, 29, and their children William, 9, Georgeanna, 6, and Jennie, 3, all North Carolina-born, appear at 352 West North Street, the address that Julia used. Wilson County marriage records show that Peter, son of H. Ellis and Jinny Dew, and Ellen, daughter of Raford and Emily Daniel, married 15 August 1869.